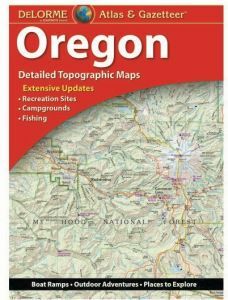 This atlas of Oregon is a great resource with roads, towns, counties and contour lines. The accompanying gazetteer is an extensive and thorough list providing helpful information such as camping locations, scenic attractions, unique natural features, bike rides, hiking, boat launches, historic sites, museums, attractions and more. Each noted feature is cross-referenced on the map pages with easy to spot bold symbols making the location of the desired feature very easy to find. The OREGON State atlas is done in two scales. The western half of the state is at a scale of 1:160,000 which equates to 1" = 2.5 miles. The topographic contour interval is 300 feet. The eastern half of the state is done at a smaller scale of 1:320,000 which equates to 1"=5 miles. The topographic contour interval is 600 feet. There are 73 map pages, and 88 total pages in this informative recreation atlas.